The last week has been very active with winter weather events, and we are not done yet. I realize that with the over achiever snow and ice storms, it is easy to think that might be the new norm. As a result, I have had a lot of (anxiety filled) questions about what is on the way next. Simply put, it looks like we have two (maybe three) winter weather events over the next week. The first one (or two) will be this weekend. The most likely impact will be Saturday, but a second wave might attempt to drop snow or mix Sunday. Then a separate storm next week on Wednesday. Something is going to happen! Those might be famous last words, and might be too vague for your comfort. But take a look at three model views of this weekend. Each model has a slightly different outcome. So the ‘something’ has agreement with snow for southern Maryland on Saturday. However, we need to consider the potential bias to end up north. Then another ‘something’ on Sunday is a different story. 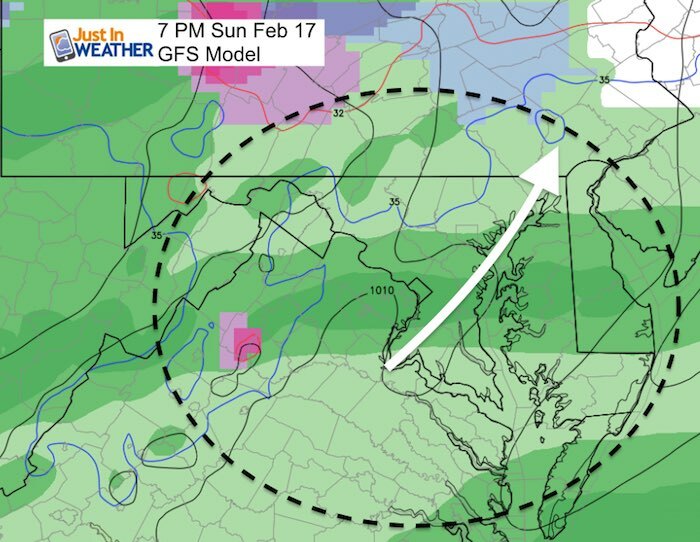 Saturday: Snow tracks south of Baltimore but crossed southern Maryland. Sunday: Steady snow and mix through central Maryland into PA, then New York and Boston. This shows the bulk of snow across northern Virginia, metro DC and southern Maryland on Saturday. Some light snow into PA. Sunday, perhaps a few flurries. Snow across much of Virgin and into metro DC. This model has nothing for Baltimore into PA, and a mix in southern Maryland and on the Eastern Shore. Here we see much more moisture, but a warmer solution with mostly rain. Some snow or mix in the evening in south central PA. Since systems tend to shift north, I would watch for any adjustment of the track for each model run. Another reason to NOT buy into any model forecasts for snow totals and impact yet. However, at this point I think it’s few to say Saturday afternoon appears most consistent with snow, wherever it tracks. This looks like a Tuesday night and Wednesday system. The GFS Model is cold with snow moving in around midnight Tuesday into Wednesday morning. Then holding snow or mix west of I-95. This model is pretty aggressive with the snow, but I have seen it trend warmer. This model brings in warmer air aloft, but keeps the ice around longer. That is the part that concerns me. After starting as snow, the extended icing into the first part of Wednesday. The biggest impact day might be Wednesday. Next week’s system is farther out and it might sound cliche, but we need to see how the first one behaves to get a handle on the next one. Also- The trend from our last event was to hold the cold south and longer than the models suggested. I mentioned that before the storms hit… So it is worth considering that for more icing for the this next event. Storms like to repeat themselves and the freezing line may try to hold south and longer like the last event.